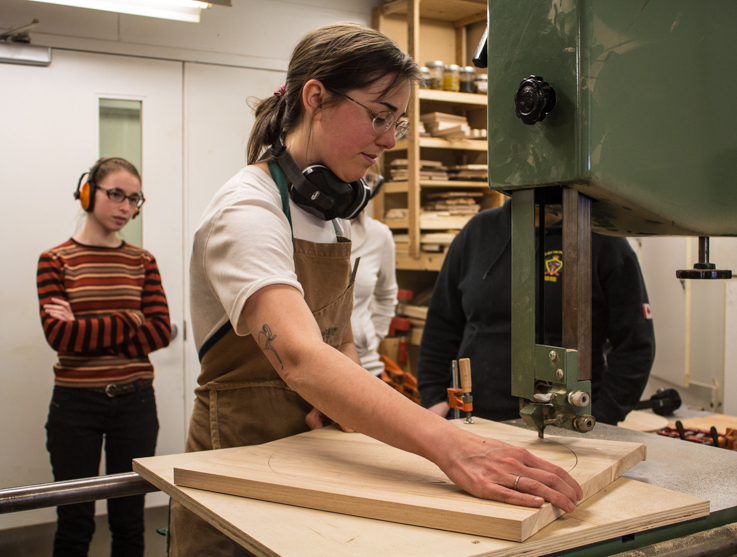 Veronica Post stands over a band saw as it whirs, tracing and cutting out the lines of a circle. Her students look on as each of them takes a turn guiding the saw. 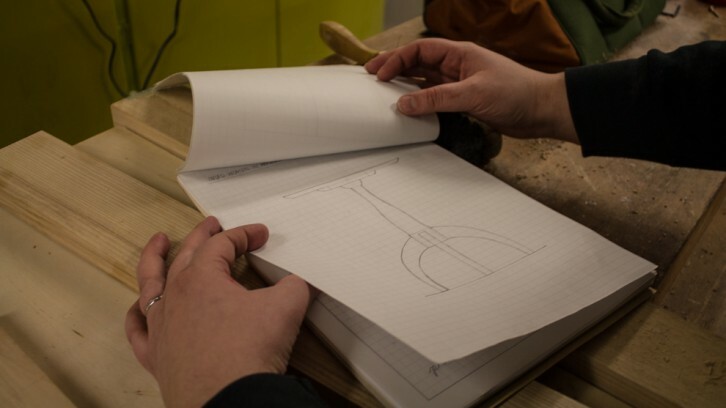 The circular piece of wood will be a part of the pedestal each woman will make by the end of their eight-week woodworking course. 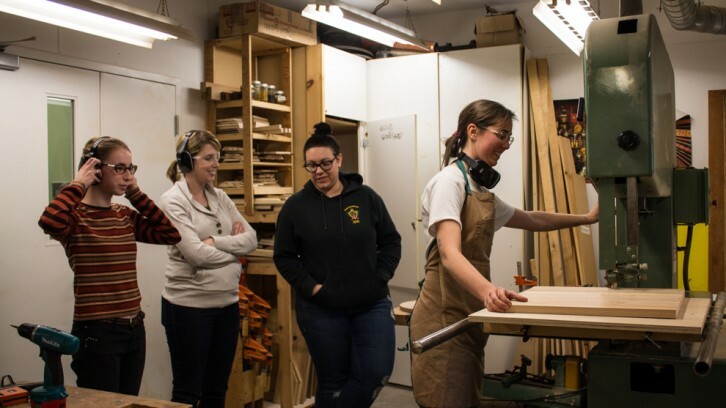 “Women in Woodworking” is a new course at the Nova Scotia Centre for Craft and Design. Post decided to pitch the course because of her experiences as a woman working in trades. Post, 31, took cabinet making at the Rosemount Technology Centre in Montreal. 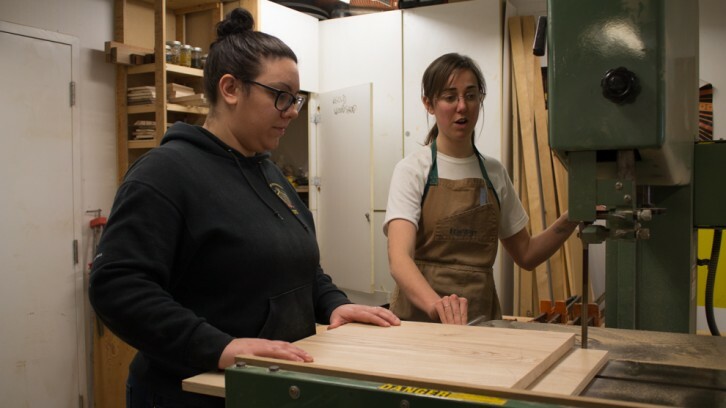 She didn’t have any experience with woodworking before taking the 18-month program in 2008, but was interested in the history behind woodworking. 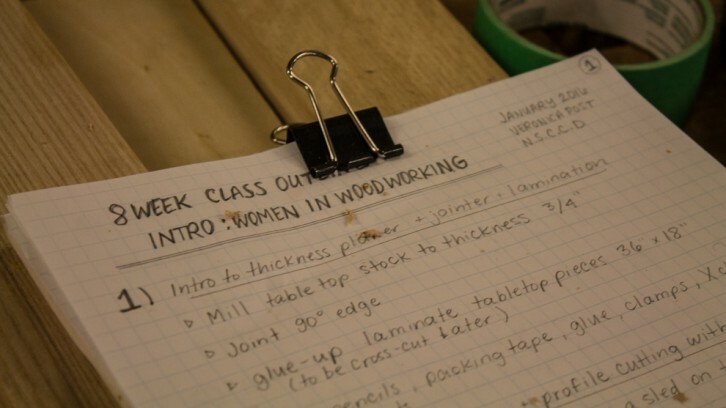 Women in Woodworking runs Jan. 31, 2016 to March 20, 2016. The students look on as Veronica Post starts the band saw. A band saw is frequently used in woodworking to cut irregular or curved shapes. One of the first designs for the pedestal. 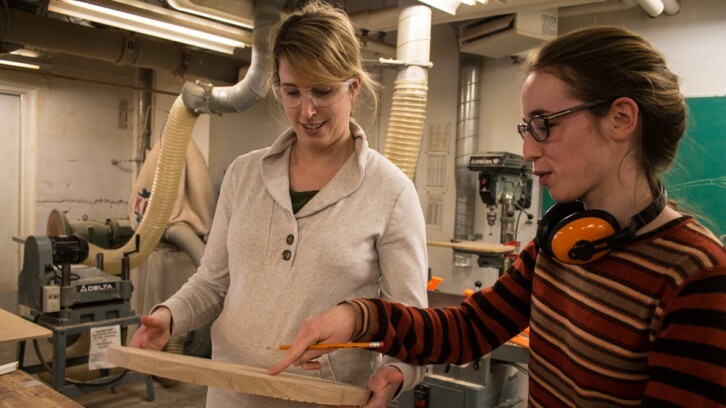 Jaimie Tax and Aleen Stanton discuss designs for one of the finished circles of wood. Veronica Post explains to Kathleen Bell how to use the band saw. Sharon Noel hopes she’ll be able to build something with her husband and son after this course. Post was the only woman in her class. She says her male peers would stare at her body while she was working and make comments about how she looked. “I started wearing loose clothing and my hair was always really short. I really tried to hide the feminine side of my personality,” says Post. When Post finished the course, she applied for jobs. Potential employers asked her whether she would be comfortable being the only woman in the workplace. When she started each new job, most of the men she worked with had never had a female co-worker. Post says they felt “awkward” around her for the first few weeks. “They didn’t want to tell me to go do this thing on a machine because they didn’t feel confident that I might be able to do it safely,” says Post. Post and her female friends who work in trades often share stories about their experiences. She has heard about people climbing up ladders to watch women go to the bathroom on construction sites, and men exposing themselves at work as a joke. Post has found it difficult to show emotion in her workplaces and has found her employers don’t accept it. “It’s silly that there is a line drawn that crying proves you’re not emotionally capable of doing the job,” she says. A Statistics Canada fact sheet on economic security stated in 2015 that “women continue to have low representation in the skilled trades and other traditionally male-dominated professions.” In 2012, women held only 12 per cent of construction jobs and in 2011 accounted for only two per cent of carpentry apprentices. 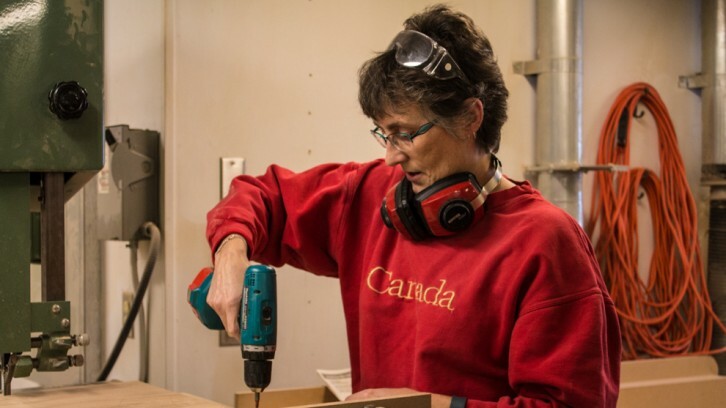 Overall, women make up only about five per cent of all skilled trade workers in Canada. 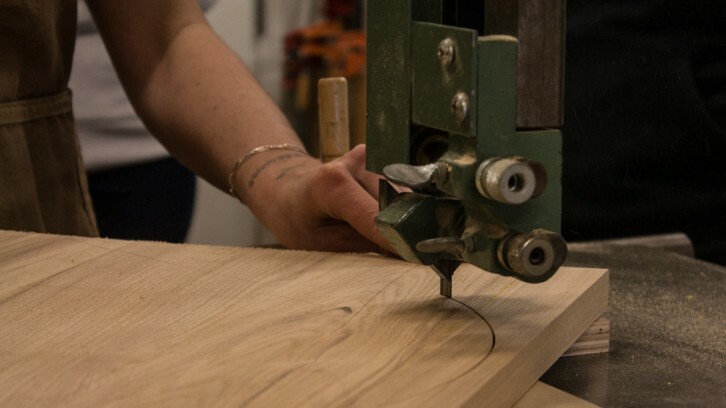 Post wants to share her experiences and love for making furniture with her class. “There is something very fulfilling with taking a piece of wood that’s rough and making something really beautiful,” says Post. Sharon Noel is an inspector with Health Canada. She had no experience with woodworking before taking the class. “My husband and son do some woodworking and fix things around the house. There are some tools downstairs but I don’t know how to use them,” says Noel. Another participant, Kathleen Bell, is hoping to learn the skills so she can eventually build a tiny house.